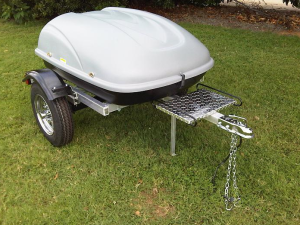 After looking at a lot of options for purchasing a Motorcycle Cargo Trailer from a manufacturer, none seemed to “fit” my bike or my price range. 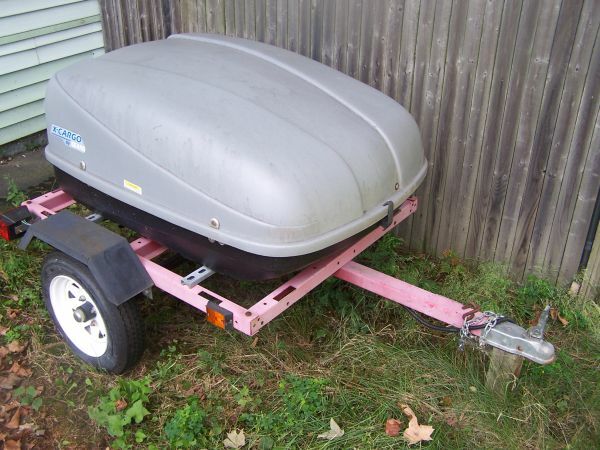 So I turned to finding information on building my very own trailer. 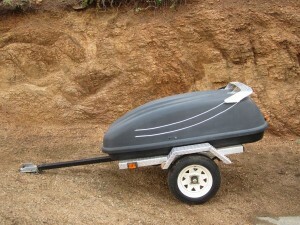 I wasn’t looking for a cheap looking trailer, just a cheaper than retail trailer. 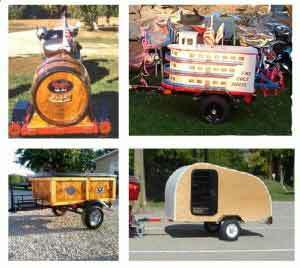 These are some easily built trailers with the starting point of a Harbor Freight Light Duty Trailer Frame. The finished trailer can turn out cheap (and look cheap) or it can turn out cheap (and NOT look cheap). 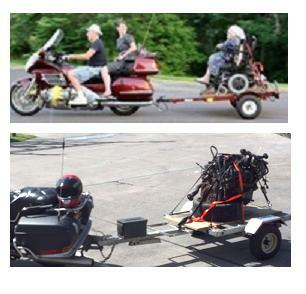 With a little creativity, and not a very large budget, you can pull just about anything. 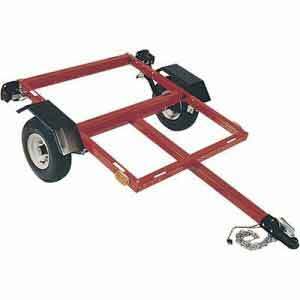 First things first, if you are not into making your own trailer frame, pick up a good quality, bolt together frame. I like the frames from Harbor Freight. They are usually under $200 and should come with a lighting kit and fenders. All together, for under $500, you can pick up a good set of tires mounted on rims, the frame with light duty spring suspension, and lights. This photo is of a simple frame with a minivan storage rack plastic case mounted on top. This rig can be put together in a couple hours, for under $500, with only a few hand tools and be ready for a test run behind your motorcycle. The frame does not need to be left exposed. 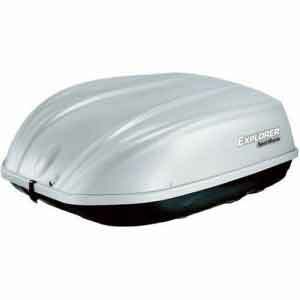 Covering it with lightweight diamond plate steel can dress it up and add durability and life- span. What about upgrading the top? What about getting a little bit more creative? When it comes to storage compartments, if you can dream it up, you can attach. Some of these are what inspired the “Pull Anything” slogan. Who says you need a storage compartment. Opting for a flat deck, either wood or steel could possibly be the best way to go. How else would you get grandma to church? Most of these can be made for under $500. 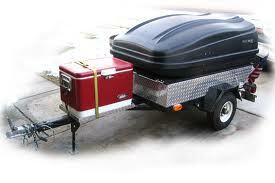 When I first decided that I wanted to pull a trailer, and not invest a lot of money, I made several of these. Every time that I dreamed up something new (better) I was able to sell the previous one on craigslist between $750-$1250. Considering I only had a few hours into each one….. you can do the math. 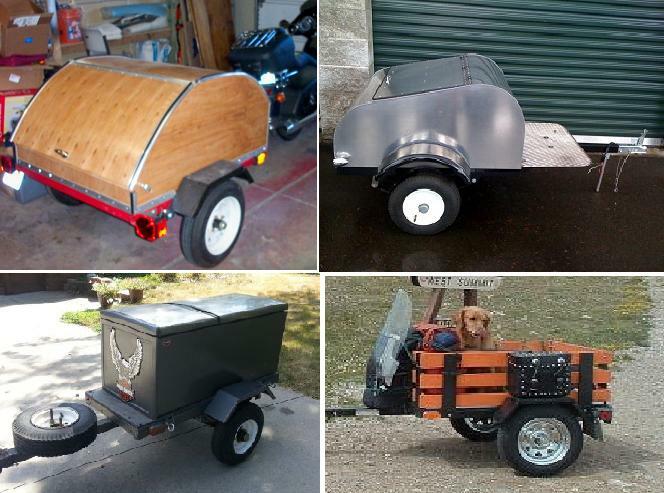 Here are a few simple bolt-together-frame and storage-bin combinations that you can easily assemble in a day and have the get that motorcycle trailer ready to go in no time flat.